Eating healthy on a budget can be a challenge but it's not impossible. A versatile but often overlooked vegetable is the cabbage. 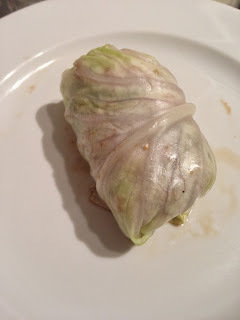 Cabbage is inexpensive and great for making wraps, slaws, and a simple boiled side dish. I cooked up this Thai version of a Southern staple, the Cabbage Roll, quickly and with things I already had in my pantry. Place steak in a ziploc bag. Mix marinade ingredients together and pour into the bag with the steak. Keep the bowl you used to mix the marinade. Coat steak thoroughly and refrigerate for 30 minutes. After, pan fry steak quickly, just a minute or two each side. Set aside to rest for 10 minutes while you cook the vegetables. Sautee the vegetables in the steak pan. Then transfer the vegetables to the marinade bowl and mix. These two steps lends a bit of the marinade flavor to the veggies. Steam the cabbage leaves for 5 minutes to make them easier to roll. Fill the leaves with vegetables and steak and roll. Optional toppings include water chestnuts, sriracha, and sesame seeds.